Congratulations on your upcoming wedding! You are planning one of the most important days of your life... no pressure. We've all been to a wedding where the important words during the ceremony just could not be heard. This was either because the sound system provided was not adequate and/or it was operated by a non qualified "soundman". Don't settle for substandard sound! Leading up to your wedding ceremony (the true focus of your wedding day), you have enough to focus on. You should never have to worry about the sound! Real Time Audio has successfully helped hundreds of happy couples on their special day. We recognize that all of the little details do matter and are willing to go the extra mile to make sure everything is perfect. 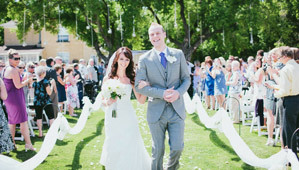 - To make sure all of the words during the ceremony are clearly heard by all. - To seemlessly time the music exactly how the Bride & Groom want. - To be unobtrusive and out of the way of picture and video. - A skilled, experienced, positive and well dressed audio technician. We are happy to mic up readers, performers and vocalists to ensure spectacular sound on your wedding day. Book Real Time Audio and have one less thing to worry about!